NETWORK FINALS: WORLD OF DANCE lost 0.1 in final numbers. CABLE RATINGS: USA’s WWE SMACKDOWN (which will move to FOX in October 2019) topped Tuesday cable, despite a 0.14 drop to 0.64, with CHRISLEY KNOWS BEST down to 0.39 from last week’s 0.50/0.44, and THE CROMARTIES back at 0.24. Bravo’s BELOW DECK gained 0.06 to 0.59. On OWN, THE HAVES AND HAVE NOTS rose 0.04 to 0.45, and LOVE IS was up 0.02 to 0.29. ESPN’s coverage of the COLLEGE WORLD SERIES was at 0.41. On Discovery, DEADLIEST CATCH dropped 0.07 to 0.41, and EXPEDITION UNKNOWN was down 0.02 to 0.27. TNT’s ANIMAL KINGDOM dipped 0.04 to 0.39. 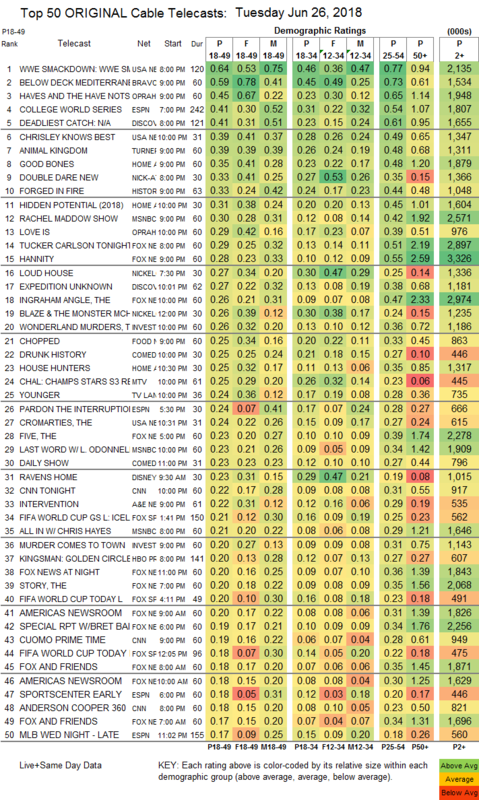 On HGTV, GOOD BONES climbed 0.09 to 0.35, HIDDEN POTENTIAL gained 0.05 to 0.31, and HOUSE HUNTERS was steady at 0.25. Nick At Night’s DOUBLE DARE continued to perform strongly at 0.33, with lead-in LOUD HOUSE at 0.27, and the afternoon BLAZE & THE MONSTER at 0.26 (both of those on Nickelodeon). On History, FORGED IN FIRE dropped 0.06 to 0.33, and lead-out FISTFUL OF STEEL premiered at 0.14. MSNBC’s RACHEL MADDOW SHOW led cable news in 18-49s at 0.30/0.42/2.6M, with Fox News’s HANNITY at 0.28/0.55/3.3M, and CNN TONIGHT at 0.22/0.31/900K. On ID, WONDERLAND MURDERS lost 0.06 to 0.26, and MURDER COMES TO TOWN was down 0.03 to 0.20. Food Network’s CHOPPED fell 0.06 to 0.25. On Comedy Central, DRUNK HISTORY rose 0.04 to 0.25, and THE JIM JEFFERIES SHOW stayed at 0.14. MTV’s THE CHALLENGE fell a tenth to 0.25. TV Land’s YOUNGER edged up 0.02 to 0.24, and the now-canceled TEACHERS was up 0.02 to 0.11. On A&E, INTERVENTION gained 0.03 to 0.22, and CULTS & EXTREME BELIEFS ticked down to 0.14. Syfy’s FACE OFF held at 0.15. 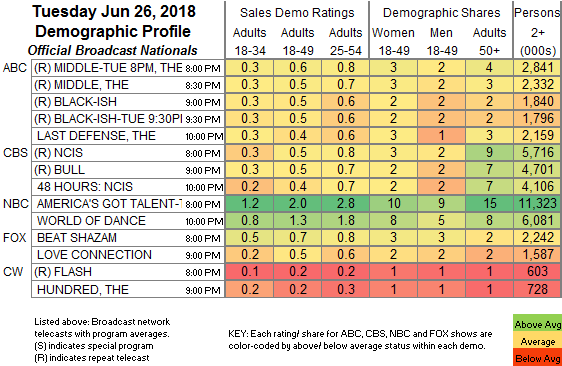 Freeform’s THE BOLD TYPE lost 0.03 to 0.14. TLC’s OUR WILD LIFE shrank by 0.04 to 0.14. AMC’s HUMANS ticked up to 0.09. WGN’s 100 CODE stayed off the chart, but was up 0.02 to aired 2 episodes, at 0.04/200K and 0.02/147K.